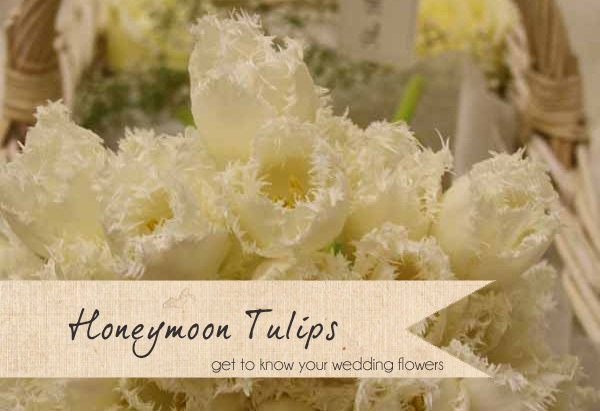 This week’s ‘Get To Know Your Wedding Flowers‘ focuses on the gorgeous frilly tulips you see at weddings, these cream frilly tulips are called Honeymoon Tulips. Karen at Passion for Flowers tells us everything you need to know about them. What season are honeymoon tulips available in? Honeymoon tulips are generally available between October and May, although as with most tulips the season peaks between December and April. Would tulips look good in a bridal bouquet? 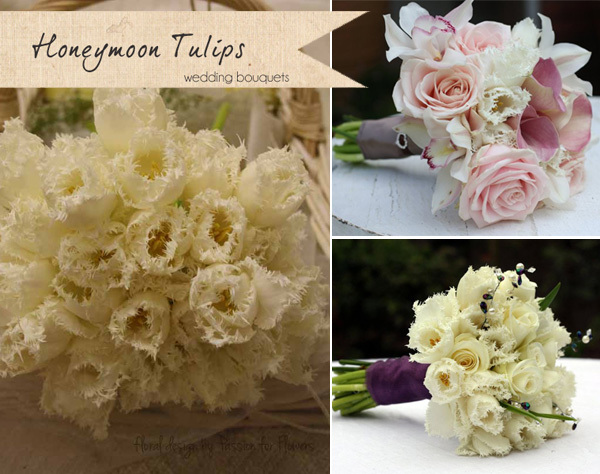 Honeymoon tulips a great favourite with our brides for their wedding bouquets. They look so romantic with their frilly petals and are just perfect used en masse for a frothy cream bouquet. 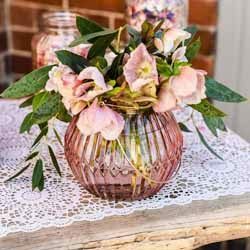 For a country style posy or mixed bouquet then use honeymoon tulips together with other spring flowers including ranunculus and anemones. Mix honeymoon tulips with roses to create a soft romantic bouquet. For a more oriental look combine calla lilies and roses with highlights of honeymoon tulips. If you’re having honeymoon tulips in your bridal bouquet then it’s tradition that the groom’s buttonhole is a flower that could have been picked from your bouquet. Honeymoon tulips with a touch of eucalyptus make a lovely button hole. 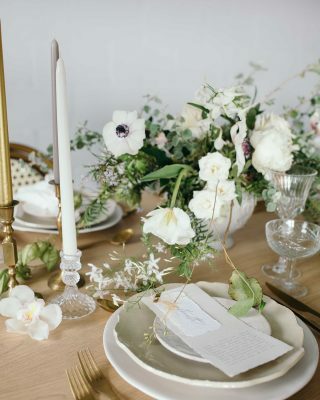 How can tulips be used as table centre pieces? 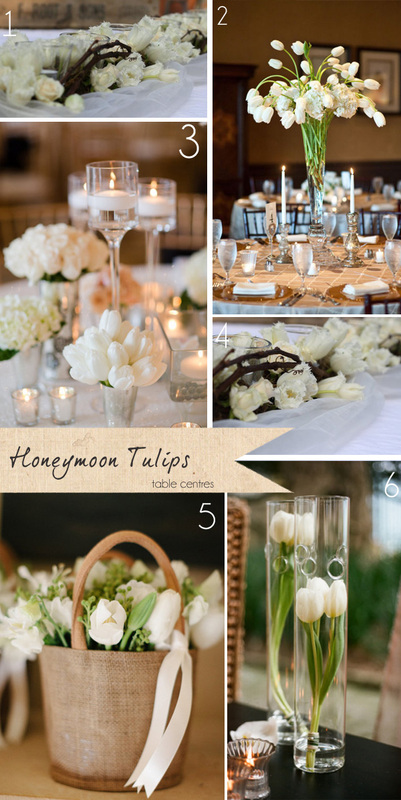 Honey moon tulips work brilliantly as single stems in small vases or bottles for a budget conscious wedding. 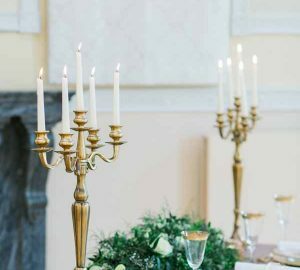 Used en masse the delicate, romantic honeymoon tulips create a gorgeous look and are both opulent and indulgent in large bunches in tall vases. 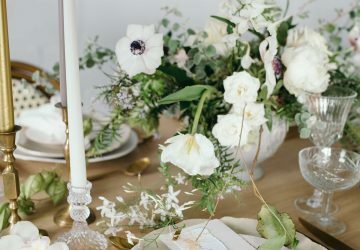 For a late winter or spring wedding then combine honeymoon tulips with a delightful mix of other spring flowers, freesia, tulips, narcissus silver chimes, roses and nerines. Entwine with twigs for a rustic woodland finish. Honeymoon tulips can be added to jugs, buckets or baskets with anemones and ranunculus for an informal mix. What other colours do frilly tulips Come in? 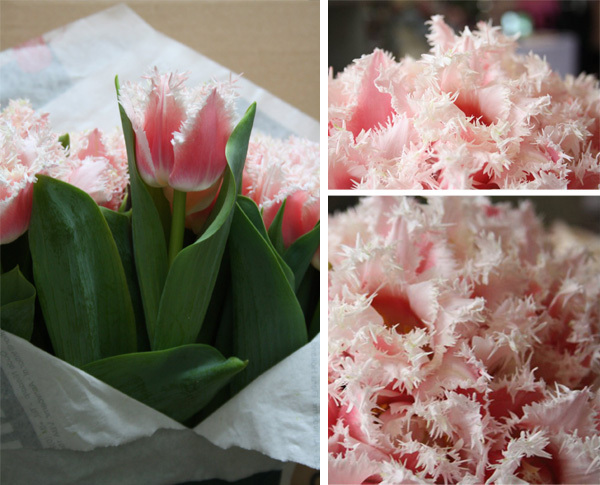 As well as the gorgeous white honeymoon tulips we can get them in a lovely feminine pink. 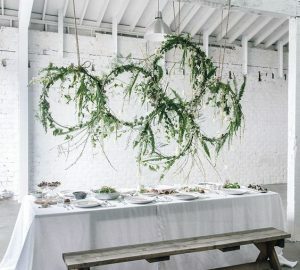 Where else in my wedding can I use these tulips? 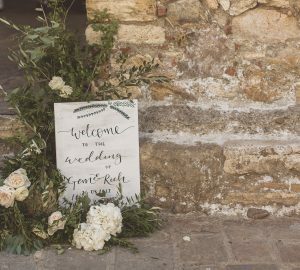 Honeymoon tulips would make romantic pew ends tied on with ribbon or in jam jars for a country church or rustic barn setting. Use on their own or mix with other spring flowers to tie into your colours of the day. 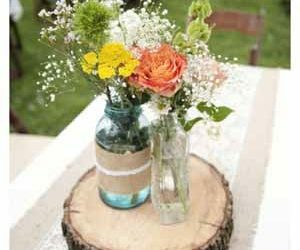 For a rustic styled table plan fill small bottles or jam jars with honeymoon tulips and attach the table and guests names on with luggage tags. 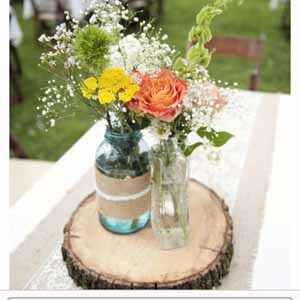 Hanging bottles are great at weddings and single stems of honeymoon tulips would look lovely swaying in the breeze hanging from branches of trees. Window sills arrangements filled with mixed spring flowers including honeymoon tulips, narcissi, ivy and muscari bring the outside in and are a delight in spring. 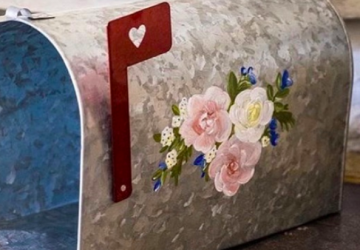 See more of Karen’s work at Passion for Flowers. Tulips have always been a favorite of mine. I knew spring was here when I would start seeing tulips, and spring means a new beginning. I’m getting married in a few months, and I’m having tulips for my wedding flowers, a flower that I don’t see too often in weddings. These honeymoon tulips are so pretty! 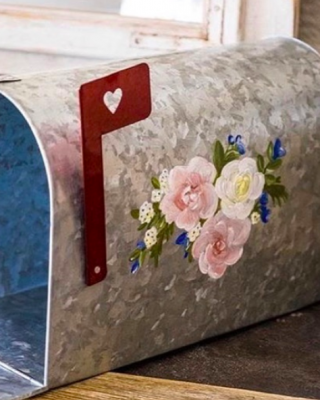 I love the frilly petals!